The source for our love of movies is different in each and every one of us. It may date back to our childhood, it may be about a particular film we saw under certain circumstances in our lives. Mine clearly come from one specific genre: the Disaster Film. I realize they may have never been the most meaningful or profound of all, but they were certainly the one kids my age were discussing in school patios in the early '70s. Back then hey had the hype, they had the long lines at theaters, they had the awesome John Williams scores, they had Sensurround, they had that unexplicable Best Picture nomination for "The Towering Inferno", they had the posters with the great artwork and the main actors boxed in little squares, depicted in various states of pandemonium. "Earthquake" was even promoted as "an Event," believe it or not. 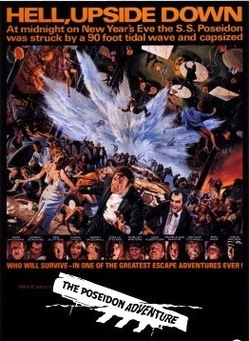 Some of the genre's finest example are "The Poseidon Adventure" (1972) and "The Towering Inferno" (1974). 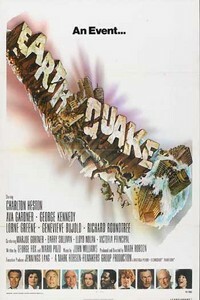 Some of its not so finest examples are "Earthquake" (1974), "Airport"(1970), "Airport 1975" and "Airport '77" Some of its very worst ones are "The Concorde," "Airport 1979," "The Swarm" (1978) and "When Time Ran Out"(1980), but I believe even they are very much worth watching in all of their badness. If you weren't around back then you'll probably be surprised to learn movie theaters did not consist of modern multiplexes with an infinite number of choices but instead of big, individual theaters with balconies (in my country, often populated by dubious characters) and sticky floors. At no time in my childhood was it more of a challenge to enter them than when disaster movies opened. Scalpers were a constant presence. I can remember the elation of finally entering a theater to watch "Earthquake" after two failed tries (the movie itself was a different story). 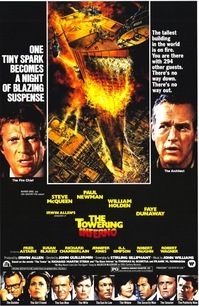 I remember having to beg to my parents for permission to go to the movies on a school day because that was my best shot to get to see "The Towering Inferno". Believe it or not but "The Poseidon Adventure" lasted about a year and a half in the same movie theater down here. Even making a mediocre movie can be an art and yes, Disaster Movies may be back today (see "The Day after Tomorrow", "2012", "Armageddon," etc.) but they're simply not what they used to be and that is the main focus of this piece.